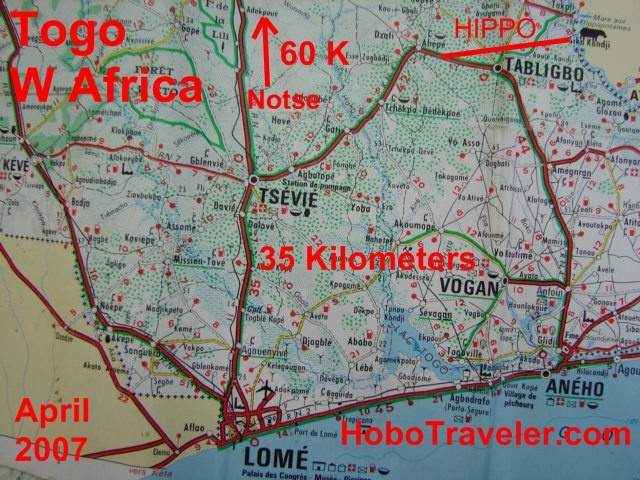 There is another small Hippo Icon on my map, directly to the right or East of the city of Atakpame, Togo. I want to find a Hippo. However, I also want to enjoy my life and not cook my brains from heat. It is really not that hot here, the rooms are designed for electricity and when there is no electricity, then too hot, because a person is using a room that is badly designed for the wrong purpose. I suppose I must look for hotels that have a group, or generator and pay for the petrol, and push them to use it. I am thinking, I need to sleep outside, camping is maybe better. Ok, I think I will go West towards Badou or towards Ghana, stay cool up in the mountains, then return to Atakpame after the rains start, I hope by then, I know more about Hippos in Togo. Map of possible routes or trips from Atakpame to the small village of Atchinedji, Togo and pronounced Aht Chee Nay Djee. These expeditions of frustration are both great, and mind baffling confusing. I decided to ask some questions of the two girls who work in the l’Amities Auberge about how to pronounced both the city of Atchinedji and the word Hippopotame in French, I also asked if they had a word for Hippo in the Akposso language, we have changed from Mina to Akposso now. The way they say to go it to go north towards Sokode, then come south, I think they have no idea. I need to travel to the road junctions, then ask some motos what is up and how to go. I need to check on the name of the local language, I may be off stream. There is a couple of web pages from some save the something web sites that talk about Hippos being in the Mono River, yet I cannot find anything specific as far a cities and clarity, just a lot of accusations. I am always in wonder at the pure lack of specific facts, when, where, dates, times, who, in these save the planet sites. I truly suspect these information blurbs when they do not say or tell a person how to go and collaborate. I am hoping to clarify sleeping and transportation before I go there, it looks like I need a home stay to have adequate time to see the Hippos, if they are even there.